This universally trusted amylose phenylcarbamate derivative is absolutely essential to any chiral screen. Lux Amylose-1 is a guaranteed alternative to CHIRALPAK® AD®. Expect equivalent or better performance when using this Lux phase. 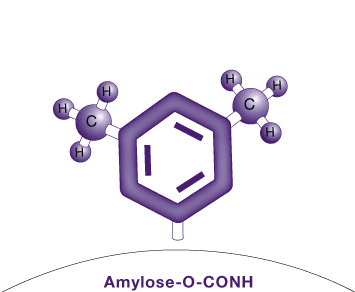 The helical structure of the amylose creates a complex steric environment that provides stronger interactions and better chiral recognition abilities. Additionally, the selector’s constituents produce hydrogen bonding, dipole, and π-π interactions that all affect the CSPs ability to separate your enantiomers effectively.